Pages tagged "community organizing in El Paso"
Over 20 years ago, a developer in the City of El Paso bought acreage in an undeveloped plot of land, an "island" landlocked by, but not included within, El Paso's municipal boundaries. The developer recorded the purchase with the County, but then â€” unbeknownst to anyone â€” illegally partitioned the land and sold the reduced-sized lots to low-income families without providing certificates of occupancy. 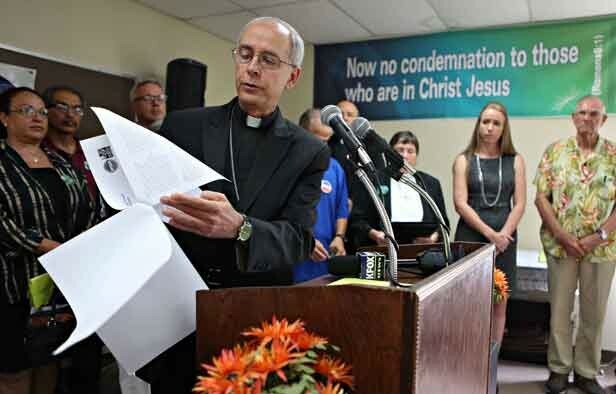 In radio coverage about the Texas governor zeroing out the Colonia Initiative Program's nearly $860,000 budget, a story about the success of the El Paso Interreligious Sponsoring Committee (EPISO) emerged. Several hundred Border Interfaith and EPISO leaders assembled for an accountability session, one day before early voting began, to challenge candidates for Mayor, City Council and the Board of Trustees for El Paso and Ysleta School Districts around the issues most impacting residents' daily lives. 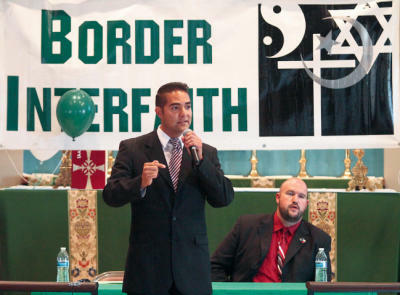 Over 150 leaders of Border Interfaith participated in three meetings with El Paso Sheriff Richard Wiles (including Lieutenants and Deputies) over the course of two months to build relationships of trust and to address community concerns. With over 100 leaders in attendance, Border Interfaith assembled with candidates for County Commissioner Precinct 4 to challenge them to work with the organization for greater regulation of payday lending, a boost to the wage floor for County employees and contractors to $10 / hour, and the investment of $100K in County funds into job training program Project ARRIBA. One candidate, Julio Diaz, committed to the agenda. The other candidate did not. Leaders vowed to spread the word and get out the vote. The same week Project ARRIBA celebrated its 1,000th graduate, leaders received word that the labor market intermediary won a Texas Innovative Adult Career Education (ACE) grant, giving it half a million dollars to train 300 more El Paso Community College students for living wage careers. EPISO and Border Interfaith, with their sister organizations in the Texas IAF, helped establish the Texas Innovative Adult Career Education grant to support projects that prepare low-income workers to attain degrees and certificates in high demand occupations including nursing and information technology. According to a 2010 report prepared by the Institute for Policy and Economic Development at the University of Texas at El Paso, Project ARRIBA's work provides a $26 return for every dollar invested. Graduates of the labor market intermediary "contribute half a billion dollars to the El Paso economy," ARRIBA Executive Director Roman Ortiz said. Clint Independent School District trustees, presented with an easy opportunity to expand representative democracy, punted. They had no good explanation for failing to make an easy decision, just mutterings about needing more time to study...."The El Paso Interreligious Sponsoring Organization has been the leader in the movement to reform Clint ISD's voting patterns.